These days, there’s an application for almost everything. Smartphone and tablet apps have become a huge part of daily life, helping us in nearly every single aspect of our lives. Apps help us get around, meet new people, find fun things to do in new locations, learn more about almost any subject, and can also help us out in a myriad of ways while doing sports, hobbies, or other activities. No matter what you're doing, apps can often be a big help, and this is even true of fishing. Fishing of all kinds can be enhanced with the use of apps that help you find fish, discover new fishing spots, plan your fishing trips more efficiently, monitor fishing conditions in all of your favorite locations, and much more. In modern times, no angler's kit is complete with a smartphone loaded with helpful apps. 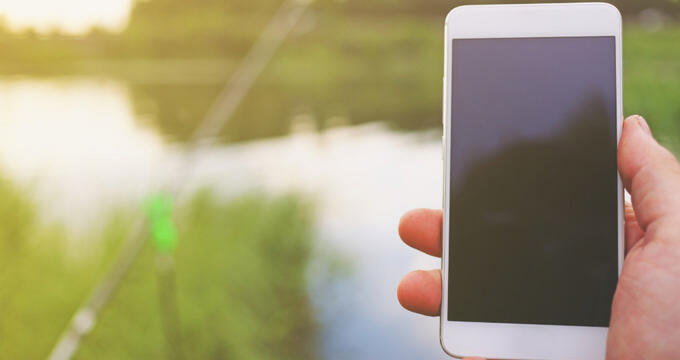 So if you’re looking for the best fishing apps to have better results out on the water, check out these great options. Effectively the Facebook of fishing, Fishbrain is the ultimate app for social networking among anglers and fishing enthusiasts. With over five million users all around the world, Fishbrain is the biggest networking app for anglers and a must-have for almost anyone with an interest in fishing. It lets you upload photos and details of your catches, as well as details on how and where you caught them. You can choose to share these images and information with friends, family, or the entire Fishbrain community, as well as checking out reports and photos from many other users. This is the perfect app for people who want to show off their biggest catches and impress their pals, as well as for finding new fishing buddies or even joining a club in your local area. Fishbrain is also fitted with up-to-date fishing forecasts for over 130 different species. The Fishbrain app is available on Android and iOS devices and is available in both a free and premium version, with a monthly fee for the latter. Next up, we have Fishidy. Speak to any angler about fishing apps, and they'll almost definitely mention this one. Available on both Android and iOS, Fishidy has a huge range of great features to improve and enhance your fishing sessions. Like with Fishbrain, Fishidy allows you to record your catches and share info about them with other users or friends. This app is fitted with maps of thousands of different freshwater and saltwater locations all around America, complete with highlighed spots for the best chances of catching big fish. Each map is also accompanied with detailed information on fish species, movements, catch patterns, recent reports, and more. This app is always being updated with new activity from individual users, meaning it's one of the very best ways for you and your fishing friends to have all the latest info. This is a really convenient, easy-to-use fishing app and many of its users have seen drastic improvements in their catches and results when using Fishidy. Both free and premium options of this app can be found, with the premium variant providing more details on the very best fishing locations and even more in-depth fishing maps. Probably the most complete app for saltwater fishing in the United States, Pro Angler provides maps and GPS coordinates of more than 15,000 different saltwater locations along the US coastline. Not only that, but this app will also provide info on nearby bait shops, boat ramps, launches, weigh stations, and other useful locations. Up-to-date reports and info from anglers all around the US will give you all the info you need, complete with weather forecasts, tide schedules, detailed stats about hundreds of saltwater species, and more. You can even find seafood recipes on Pro Angler to cook your catches. As with other fishing apps, this one is available on both Android and iOS, with free and premium choices. This app is best-suited for planning out your fishing trips ahead of time and knowing all the various conditions at your favorite fishing locations. This app gathers up a whole lot of data and uses it to provide impressive analysis of fishing spots, complete with predictions of fish movement and feeding patterns. Fishing & Hunting Solunar Time makes use of solar and lunar movements to track many different species of fish, providing pinpoint locations for the fish you want to catch, along with sunrise and sunset times, weather forecasts, and more. The premium version offers extra info for saltwater fishermen.